In 2019, AccorHotels will add another prestigious development to their ever-expanding resume. This hotel will be located in the magnificent Mahanakhon tower – the once tallest structure in Thailand. The Mahanakhon is located in the Silom district and has stood since 2016. As you will see below it already has a wealth of attractions and is a popular building in the heart of Bangkok. In this article we look at this new development – The Orient Express Hotel, and what features it will include! King Power Duty-Free & Retail – This shopping centre offers a fantastic variety of tax-free goods. You can purchase typical duty-free goods such as perfume, cosmetics and chocolates. Furthermore, there is a great selection of fashion and electronic goods. Observation Deck & Skywalk – This is the main attraction of the tower and well-known around the world. At the top of the Mahanakhon, there is an observation deck. This provides unrivalled views of the Bangkok cityscape. Furthermore, there is a huge glass skywalk you can dare to walk over – you can slip on some booties and tiptoe over the glass 314m in the air – the feeling is both exciting and terrifying! Mahanakhon Square – Outside the impressive building there is a beautiful square. This square is a public space and is often used for festivals, events and even fashion shows. 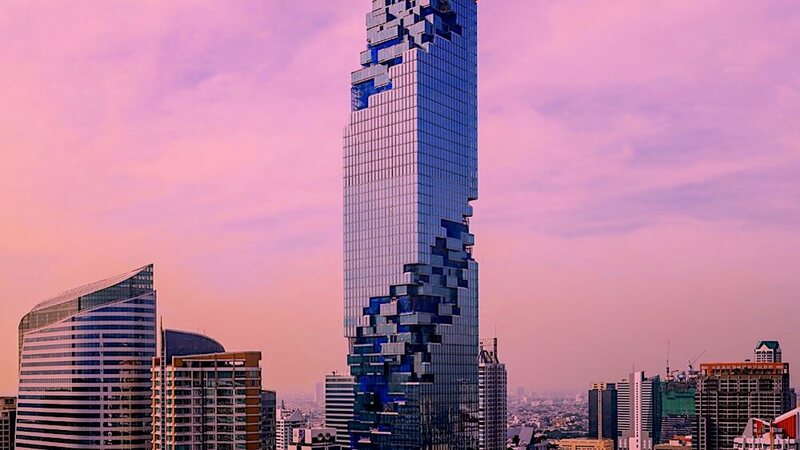 In short, the Mahanakhon already has a great deal to offer and is one of the premier skyscrapers in Bangkok. The style of the hotel is expected to be lavish and extravagant. This mirrors the original style and luxury of the Orient Express train that brought us the world’s first sleeper cars and prestigious rail travel. It will also feature two signature restaurants – Mott 32 and Mahanathi. To extend on what is meant by the “wellness” area – The Orient Express Hotel will feature a whole floor dedicated to recreational pursuits. This will include a fantastic outdoor pool, a Jacuzzi, and even a special signature Orient Express Spa! The hotel will cater towards wealthy foreign business people from overseas. It will mainly serve a high-end market, but also attract tourists and travellers too who want to experience the luxury Bangkok has to offer. It will certainly boost the importance and relevance of the Mahanakhon tower and the fortunes of King Power.